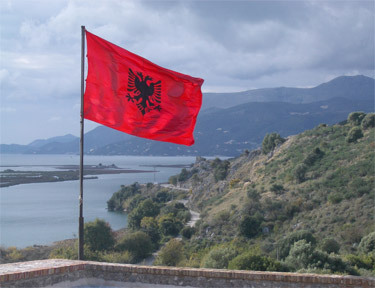 The Albanian flag near the southern border. We found ourselves mimicking the "We're going to Disneyland!" slogan with saying "We're going to Albania!" Who would have thought we'd go to Albania after reading all the dire warnings about it. The guide books and government websites advise great caution and strongly recommend not driving at night and possibly not being out at night at all. Terrible drivers on terrible roads with monstrous potholes has one advisory source recommending using a 4WD for any driving in Albania. They also toss in warnings of tarmac melting and becoming slippery in the heat. Corruption, organized crime and poverty add to the list of institutionalized hazards for tourists to dodge. We've always respected those admonitions and several times Map Man had carefully routed us around Albania. But when we got to the Greek island of Corfu, Bill read about a tantalizing day excursion to Albania from Corfu. Not surprisingly, the organized day tour only runs in the summer months but the staff at the tour company urged us to go on our own for several days. She carried on about how well we would be received and how nice the people were. (She was so enthusiastic that Bill wondered if she was Albanian). We struggled to reconcile these polarized images of Albania but a look at the map added some clarity. Saranda, the port city that would be our base, is in the southern most tip of Albania and is flanked on 2 sides by Greece and by water on the third side. We imagined that the summertime boatloads of Greeks and other tourists had turned this into a resort village and that like most resort villages, it would be very different than the surrounding land. We also assumed that the recently developed UNESCO archeological site15 miles out of town probably had also had a gentrifying effect on the southern tip of chaotic Albania. So, very excited and a bit scared, we decided to venture into this least-Albanian part of Albania. It was a Catch-22: if it was safe enough for us to visit comfortably, it wouldn't be a true experience of Albania; but if it weren't that safe, we wouldn't experience any of it. on her back after they left our ferry. We now try to never enter a new country without a guide book, especially the more alien it is to us and we lamented having ditched our eastern Europe guide. That guide book and the ones for Greece and Italy and the Italian phrase book are all titles we would have kept had we known we weren't going to Australia. But we'd need a BOB trailer to carry all of our maps, guide books and phrase books for a year and so they were all left behind months ago. The bookshop owners in the main city on Corfu were speechless when we asked for an Albanian guide book in English, which I guess was to be expected from a tourist town that disbanded its tourist information office. They don't even give away or sell a decent map of their own city in Corfu. Second best was putting in some time online for the basics, like the exchange rate and the names of a few hotels in Saranda. Feeling unusually information naked, we headed out the next morning on the once-a-day ferry to Saranda, which is where our Albanian cultural immersion experience would begin. We couldn't decipher the languages being spoken, but finally decided that the bulk of the 30 or so people on our boat were probably Albanian and later a glimpse at the passports confirmed that. We were mere tourists but these families had been on serious shopping trips. There were 4 large TV's still in boxes, a small new washing machine in its original container, a patio door-sized window blind in its "Made in Germany" stamped box, several 30 lb bags of laundry detergent, bundles of potted plants and dozens of cheap duffle and large plastic bags brimming with clothes and household goods stacked in the passenger compartment of the boat. No attempt had been made to retain access to the women's toilet when people dumped their merchandise in the first available place. 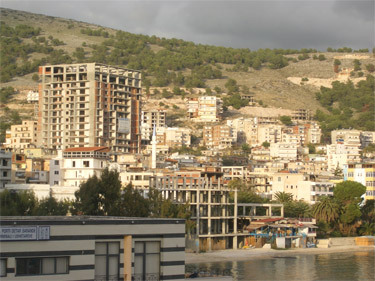 Some of the partially finished buildings in Saranda. As our floating supermarket approached the Albanian port an hour and a half later, we were startled by the sight of what turned out to be several hundred half-completed, large concrete buildings in this small city. The Balkan Peninsula, especially Croatia, is peppered with unfinished structures, but here they dominated the skyline. Our first guess was that they were hotels and we later decided that they were condo's for the northern Europeans. Bill's explanation seemed a perfect fit: that Saranda was the new hot spot for Germans and Brits to buy a place in the sun. We were surprised to learn later that these apartments were not for foreigners but second homes for Albanians from the capital city of Tirana. Exiting the customs building, I was shocked to see a half dozen Mercedes Benz cars, most of them blue taxis. And as we rode onto the city streets, there were Mercedes everywhere. Here we were in the poorest country in Europe and it looked like a Mercedes Benz parking lot. It seemed that three-quarters of the cars, trucks, buses and even concrete mixer trucks--literally anything with 4 or more wheels, was a Mercedes. And they didn't just have a stolen logo or hood ornament but were authentic. The hubcaps and the styling were clearly the real thing. Sleek, spotless new ones; dusty old ones with heavy-duty luggage racks on top and everything in between. 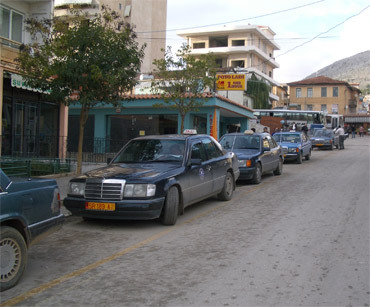 I imagined that every model and every color Mercedes ever made was in Albania. It was hard to notice anything else. These were cars we considered out of our price range and yet we were now surrounded by them in Albania. I couldn't begin to guess the reason for the phenomena but Bill did: Albanians prize Mercedes for their sturdiness. The young Albanian man who became our "Answer Man" said that Mercedes were built like the US military's Hum-Vee's and that they were the only car that could withstand the rigors of the notorious Albanian roads. He said "Albanians love Mercedes Benz cars" and laughingly added that there were more Mercedes in Albania than Germany, which could be true on a percentage basis though not as an absolute number. Mercedes-Benz taxis waiting for customers. We were quite pleased to have arrived in Albania in mid-morning as it took the pressure off of getting settled. With no signs or maps to guide us, we headed out onto the streets clueless as to where to go. Our lack of direction quickly became secondary as surviving the intense head-turning and staring quickly became primary. Bill didn't even make it the first block and one of the taxi drivers stopped him for an inspection of his souvenir pin collection on his handlebar bag. We are certainly accustomed to being noticed, but I found this industrial-strength staring to be depleting. I just kept pedaling, hoping the physical exertion would smooth out my stripped-naked feeling from all the gawking and that we'd get somewhere with fewer bystanders. But we'd only gone a few blocks when a taxi driver chased us down in his Mercedes to explain in broken English that we didn't want the road we were on--the center of town was somewhere back the other way. We don't usually flounder so, but after a huddle we decided to press on without worrying too much about where we were going. It was early, the town was small, we'd eventually stumble across the hotels and we'd take in the sidewalk scene as we pedaled. A dirt pedestrian thoroughfare in the center. 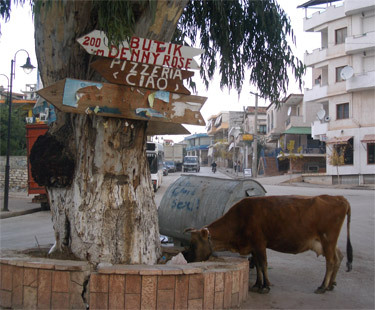 Saranda was reminiscent of Turkey in the harsh juxtaposition of new and old, but even more so. We didn't go far in any direction from the port in Saranda before we were encountering dirt roads and dirt walkways. There was a new promenade by the waterfront and new curbs and gutters along the main streets, and some smart new buildings but it was very rough around the edges. I quickly became eager to find a hotel so as to ditch our bikes and get out on foot. I wanted to be the one doing the staring and it was too hard from a bike, especially when we were attracting so much attention. 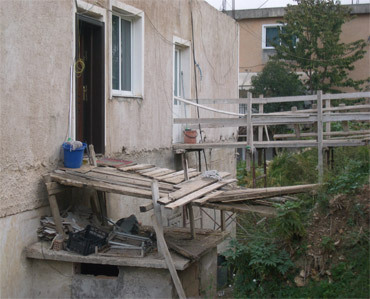 Bill's internet search on Corfu was accurate as there were reasonably priced, modern hotels in town. He grabbed the first one he looked at, which was a 3 year old, purpose-built hotel with rooms under $40. Reluctantly they allowed the bikes to be brought indoors and we slowly learned that our hotel was still a 'work in progress'. We dropped off our gear, grabbed our picnic lunch purchased on Corfu and headed out to do the staring. I hoped to nab a stealth photo of the woman who appeared to be selling rows of used shoes on the sidewalk by the port. One by one we started experiencing the things that make Albania a virtual "no-go" for tourists. We weren't on foot but a few minutes and we both felt "locked-on-to" by a young man--he looked too long and then crossed the street to fall in right behind us. Alarm bells went off in both of our heads and we quickly diverted off the sidewalk feigning a look at the useless map in hand, forcing him to walk on by or be too conspicuous. Who knows if he was up to no good, but its rare for us to simultaneously feel like such a target. A couple of minutes later we were peering down into one of Albania's famous potholes and indeed, it was no ordinary divot. (In places like Turkey, we've learned to love potholes as they serve as traffic calming devices.) 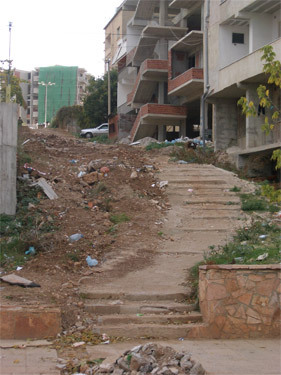 Saranda is built on a steep slope and some of the streets are built on platforms to level the grade. When these platforms perforate, the hole is a storey deep. The first of these potholes we spotted was big enough to drop a small table through, though garbage instead of tables seemed to be pitched in it. 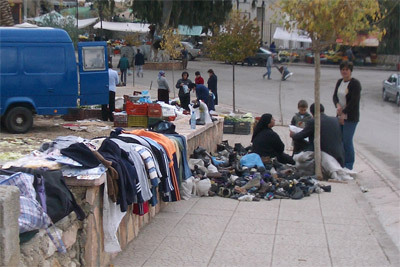 Selling shoes and clothes on the sidewalk in Saranda. And a couple of hours later we experienced yet another of the problems plaguing Albania: power outages. The power went out while we were walking along the dirt and pavement road leading out of town and was out for about 5 hours. After that, we only had power intermittently. If we are ever in Albania again we'll know to ask the hotelier: "What is the price? May we see a room? Do you have a safe place indoor for the bikes? "Do you have a generator?" On our walk we noticed a number of hotels and restaurants with generators but that item remains on the wish list for our hotel, along with its elevator and satellite dish. We weren't in forbidden Albania more than a couple of hours and we were congratulating ourselves on our successes, despite our brushes with the problems of Albania. We had survived the unexpected closure of the ferry ticket office at 7 45 in the morning; we barely squeezed our loaded bikes through the narrow railings on the ferry's gangplank; we hadn't puked in the rough seas; we found a hotel in short order; and we had made it on to the streets to snoop around. We'd gotten cash at an ATM and swapped bills at the bank for the small denominations needed for the sidewalk vendors; bought food and water for the next day; and found postcards and stamps for the town. And the icing on the cake was we had formulated a plan for our stay. We'd take the local milk run bus to a scenic hillside village the next day, expecting that the bus ride itself would be the high point, and the following day we'd bike to the archeological site as a day excursion. On the morning of our 4th day in Albania, we'd hop on to the ferry back to Corfu and hope to be on a larger ship that night bound for Ancona, Italy. Ah, in this year of failed plans we'd pulled a small side trip out of the hat even without the comfort of a guide book. Our only disappointment our first day in Albania (aside from hours without power to read and recharge the laptop) was that our hotel hosts didn't speak enough English or German to help us plan our excursions. We had hoped to discuss road safety issues to help decide whether to bike or bus to the archeological site and whether to spend a night there or do day trips from Saranda. Their little bits of English and Italian they did speak helped and later we were able to get the bus drivers to write down some schedule information, so we managed to get enough information for making decisions. But once back at our blacked-out hotel, we discovered that the adult son of the hotel owners was a competent English speaker who had studied in Toronto for 3 years. This young man became our "Answer Man" as he kindly chatted with us our first afternoon in town. It was he who told us the secret love Albanians have for Mercedes and that the condo owners were Albanian and not northern European. But it didn't stop there. We were fascinated to learn more of what makes this pocket of Albania different, which is the high percentage of Albanians of Greek origin. As we understood it, some time after the collapse of the communist government in 1991, the Greek government arranged for Albanians of Greek descent to have a special status: they have Albanian passports with Greek citizenship. They can enter both Greece and the EU as though they were Greek citizens and can even work in the EU but they are legally Albanians (and to the US government, they are only Albanians). These Greek Albanians have their own political party that always wins enough votes to snare a ministry seat in the government. In addition, the government is obliged to pay for bilingual educations for this recognized minority group. And our host has this on good authority as his mother is an Albanian born Greek and so the privileges extent to him too. This special minority status is in recognition of one of the many 'mistakes' at the end of WWI when the map of Europe was redrawn and this pocket of Greeks ended up in Albania. They apparently had a special status under communist rule too. If they were loyal party members and had "good credentials" they were allowed to visit their relatives in Greece. The visits were under the condition that they lie when in Albania by telling Albanians how much worse off people were in Greece. This young man also shared with us how much Greeks hate Americans--something I had just recently gotten wind of. In Athens a 34 year old museum guard started chatting with me and commented on how much he had always hated Americans. He said that in talking with me and other Americans in the museum that he had learned that we were really very nice people. I don't know which particular grievous error of our government earned this old scorn but I was pleased to hear that tourists putting a face on our country's people really does help to improve our image abroad. When he heard about Bill's background, our Answer Man quizzed him as to how big a problem baby abandoning is in the US. The Albanian government encourages large families but it is also common for parents to abandon babies in hospitals as they can't care for them. Our Answer Man attributed the bad roads and extensive power outages to government neglect. The infrastructure was built under the cash-short communist regime and corruption had plagued the recent governments. Apparently Albania's post-communism era top man for 8 years had a taste for the global casino-scene, presumably spending the public funds leaving too little for improving basic services in the country. Albania has extensive hydroelectric resources, so much so that they entered into long term contracts to provide power to Greece. 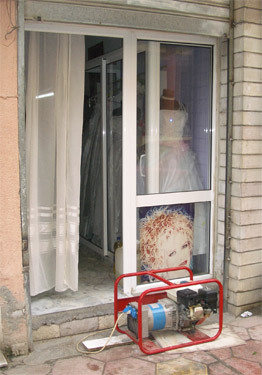 Now that Albanians are buying big TV's and washing machines, they have to buy back power from Greece at inflated rates. Our Answer Man also commented that English was the official second language of Albania. We didn't see much evidence of it, but it did explain the English on the label of a bottle of water we bought, though the translation was a little weak: "Suffled how it gush from the source of the woods...."
For about $2 each we hopped a local bus to the historical town of Gjirokaster about 35 miles from our base of Saranda. Seeing the historical town was the reason for going but we had no sooner made the decision and realized that the journey would likely be even more interesting than the town itself. Indeed, we were captivated by the 1 1/2 hour bus ride, both to and from Gjirokaster. Albanians rely heavily on buses for transportation as few have cars and the limited train network only began being developed in the 1980's. Like on the boat from Corfu, TV's, piles of house wares, large bags of building materials, and a huge sack of onions traveled in the luggage bay of the bus. At one impromptu stop up a winding hill, 8 young men with luggage darted off the bus and began running up the steep slopes like bandits. We trusted that there was some remote village in their sights and that the hurry was to avoid the threatening storm. Much of the road to Gjirokaster fit with the dire warnings we had read regarding driving in Albania and we were happy to not be on our bikes. For miles the main road north from Saranda was little more than one lane with occasional pull-off room for an oncoming car. Most of the time there was no pretense of a center line. We did cruise on some stretches of fresh tarmac but much of the road surface was terribly rough. The on board ticket taker was quick with a plastic bag for those whose stomachs were overwhelmed by our serpentine course. Our bus driver's view of the flock. We "oh'ed" and "ah'ed" our way to Gjirokaster. First it was the narrow, steep, windy and occasionally very rough road that captured our attention. At other times it was the dramatic mountains and huge expanses of stratified rock that had us pointing and clicking. And other times it was the hundreds of concrete pill boxes left over from WWII or the subsequent Cold War years. We'd seen bits and pieces of 20th century forts and defensive fortifications all over Europe but Albania's relics outnumbered all others. At times the concrete domes were just paces away from each other, sometimes dozens were in view at a moment. As our bus snaked down one mountain we saw at least 15 rows of 50 or more concrete pill boxes laid out like wind break trees planted between fields. Presumably long abandoned, their chilling presence intruded on villages, farms and open spaces alike. 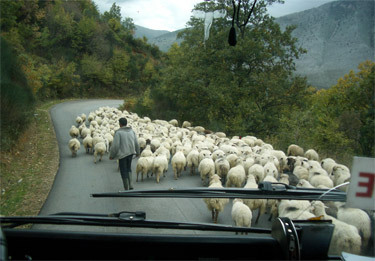 We'd encountered sheep and goat herds on the back roads of the Balkan Peninsula before but both on our way to and from Gjirokaster the main road was blocked by herds. The traffic was light enough that the shepherds appeared to routinely share the road with vehicles. This was the first time however we'd seen shepherds that were out with their herd for an extended period as these 4 or 5 weather-beaten men had an equal number of pack mules loaded with gear and metal milk containers. Lunchtime supervising of the stone roof job. The Albanians' fondest of American's came up again and again. 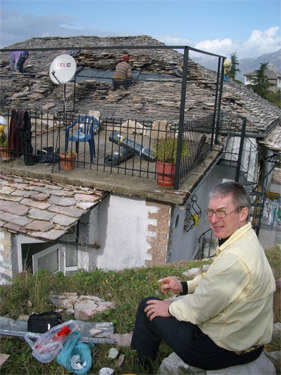 Since the workmen seemed flattered rather than offended, we spent our hillside picnic lunch at Gjirokaster watching the men installing new sheeting under a heavy stone roof. It wasn't long and one of the workmen and then the owner were offering us hospitality. The home owner immediately pegged us as Americans and volunteered in English that he loved Americans. He offered to bring us coffee, tea, wine or raki to supplement our picnic lunch. Another pro-American statement was the display of 3 flags at several hotels: Albanian, EU and US. Repeatedly during our brief stay in Albania I felt like we were the farthest away from western Europe that we'd been--it wasn't true in miles, but seemed true in culture. It was the shortage of western culture orderliness that I was reacting to--the barely controlled chaos that I imagine dominants the backstreets in countries like China or India. The bus "terminal" was one such instance. When we decided to take a bus to Gjirokaster, there were few familiar formalities to assist us. There was no signage pointing the way to the bus station (or the port, for that matter.) We found it by going into tour agencies knowing that we were in the wrong place but rightly guessing that they would direct us. After a few inquiries that got us closer and closer, a visitor to one office finally walked us the rest of the way to the bus station. "Bus station" is a bit of an overstatement as it was just a dirt and concrete patch off the street where 2 or 3 buses parked. There was no sign indicating it was the bus terminal and no building. There was no place for customers awaiting a bus to sit, no awning or other cover from the weather, and no information board with schedules or fares. We relied on writing big on the back of a map with our "To" and "From" cities with blanks for the times to get us an approximation for the schedule. And, as other Albanians were quick to do, the price was indicated by showing us the appropriate paper denomination. Nervous, we returned later to ask a second bus driver as we wanted to be sure we could get back to Saranda and our hotel the same day. A semi-permanent, make-shift ramp from the front door to the street. The abruptness with which asphalt and concrete disappeared from tracks for cars and walkers was another divergence from western culture orderliness. The main streets in Saranda were paved, though that wasn't true for all the roads leading into villages we saw from our bus to Gjirokaster. And in Saranda, paved roads would suddenly give way to dirt or once paved surfaces. We sometimes found ourselves scrambling across bare dirt and loose rock to get to a market or the next street. And precarious, jury-rigged solutions seemed to be accepted as normal by residents in places where it looked to us that the municipality was shortchanging its citizens. And there were other things that signaled Albania plays by a different set of rules. Of course, the 'more off than on' power supply to the city was a reminder of their lower standards. And we were quite amused by snapping a shot of a cow munching her way through the leftovers of a street market in a center-of-town dumpster--we were all the more surprised when the police didn't bat an eye as they drove by. Perhaps she was just making her daily rounds and would soon find her way home, though unescorted cows aren't the norm in other European cities. The cow cleaning up after the green market closed. Terrible dental health in many Albanian people we saw spoke to too many people living with too little for too long. We saw adults with discolored teeth and gums like we'd never seen before. 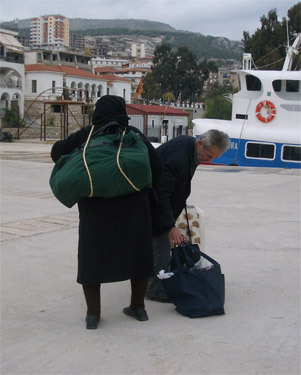 And even on the ferry ride from Corfu I was struck by how few people were wearing eyeglasses. We jokingly thought that poor vision might explain some of the dangerous traffic conditions we read about. As we walked the streets in the couple of towns we visited we didn't notice any optical shops--shops that are as common as cafes in most of Europe. Most of the Albanians we saw were dressed in fresh contemporary clothing but eye and dental care appear to be luxuries beyond the reach of many, even though we were visiting a more stable and presumably more prosperous part of the country. Our Saranda hotel Answer Man said that the oppression by Albanian's communist government was worse than any other communist government--worse than that in the former Eastern Germany, worse than that in current North Korea. We had no way to verify his comments but he was adamant. He said that if an Albanian tried or succeeded in escaping the country, that relatives out to the 3rd cousin level would be removed from the community and be placed in isolated villages with limited resources and limited education for their children. Search lights scanned the ocean waters at night looking for people trying to leave the country illegally and there was a heavy use of citizens spying on citizens to force compliance. He used the phrase "good biograph" often, which referred to your loyalty to the party, lack of criticism of the government, whether a family member died honorably during the war and perhaps some other features. Your good biograph determined if you could leave the country to visit family or to study abroad. The only "Beautifying the Bunkers" effort we saw. The Answer Man said that the bunkers we saw were build from the 1950's into the 1990's. We had guessed that there were thousands of them--he said hundreds of thousands. 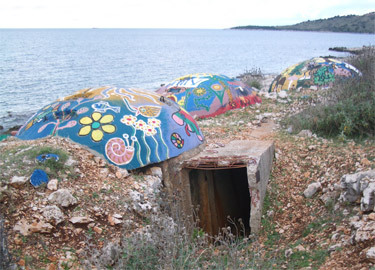 The bunkers were intended both to house the nation during an invasion and to house troops fending off an attack. Each bunker was the price of an apartment and the propaganda machine was effective enough for the citizenry to believe the bunkers were the better investment. Part of the past Albanian propaganda, like in current day Northern Korea, focused on fantastic stories about how much worse off everyone else was. The Albanians were convinced that the people in the US and Europe were starving, had no electricity and had bad roads (and probably no Mercedes). An older man Bill spoke with on the street also commented without specifics how severe the propaganda was. He considered it a personal accomplishment to be capable of welcoming an American given the horrific things he believed about our country during his long career in the military. He also shared a favorite Albanian saying: "The workers pretended to work and the government pretended to pay them." He felt that their socialist system failed because there was no incentive to work and so productivity was low. The man also commented that he had a brother in New Jersey. We both stifled our giggles as many Europeans, especially Eastern Europeans, have commented that they have a relative in New Jersey--as Bill said "New Jersey must be quite a place" as it has received a steady flow of modern migrants. In Saranda we felt like we were never out of sight of the police--it wasn't that they were following us--it was that they were everywhere. Sometimes it's intimidating, but given Albania's reputation for crime we found their presence reassuring after we got over the shock. Their modern dark blue uniforms that included a pullover knit sweater signaled a community policing model was in place rather than their former police state approach. And watching them in action revealed that their attentiveness was nicely balanced with broad smiles and causal conversation with the neighbors. We never had cause to contact them and they never gave us a second look. Of course hearing our Answer Man's tales left us desperate to know more about how Albania got itself into this pickle. The geographical overview of Albania in our electronic encyclopedia made Albania sound like a little bit of heaven in this modern age. Its mountains in the north receive about 100" of rain a year, allowing the country to produce almost all of its electricity from hydroelectric sources. It has enough petroleum reserves to meet its own needs and still export a little. Albania's list of mineral resources is impressive and it is one of the world's largest producers of chromite ores. And the lists of animal and agricultural products complete the look of a country that should have a long history of feeding and powering itself as well as having sufficient surplus resources to trade on the world market. Reading about the social history paints a different picture. The ancient Illyrian people of Albania flourished under the Greeks, the Romans and the early Byzantines. But when the Byzantine Empire convulsed and contracted in the 9th century, Albania became a revolving door for invaders, with occupation by the Serbs in the middle of the 14th century leading to a mass exodus. It wasn't long and the Ottomans starting knocking on Albania's door and by 1520 had it under its thumb. As a consequence, about a fourth of its population fled and Albania entirely missed out on the Renaissance and the humanistic thinking that emerged. The process of the Ottoman conquest trashed the Albanian economy and culture but the ongoing struggles with the Ottomans did forge a new Albanian identity. For about 400 years Albania was stuck in a time warp and its society was defined by feudal land ownership, blood feuds, and shortages. The transformations brought about by the coming of the railroad in the US and much of Europe just didn't happen in Albania, along with other advancements like electricity. When local and distant powers were redrawing the borders in the peninsula after both WWI and the Balkan Wars a few years earlier, Albania wasn't on the new maps--it was to be divvied up as war spoils among its neighbors. Voicing its sense of nation barely allowed it to survive, though the borders that were drawn didn't reflect the ethnic realities and about half of the Albanians and their land were left outside the country. "Kosovo" would be an unknown word to most of us today if it had been left as a part of Albania instead of given to Serbia at that time. Albania survived WWII as a country but its iron-fisted leader Hoxha triggered another wave of migrations out of the country. A strident Stalinist, he first allied the country with Yugoslavia, the USSR and then China. None remained true enough to the Marxist-Leninist cause and in 1978 he severed relations with the last of them (and their desperately needed financial aid) and committed the country to a path of isolation. Though Hoxha brought about some positive changes in his over 40 years of iron-fisted rule, the country remained mired in pervasive poverty, overwhelming illiteracy and debilitating epidemics. His hand-picked successor initiated reforms from the beginning of his rein in 1985 but the communist system collapsed with the others in those era-ending years between 1989 and 1991. Albania, like a number of the Balkan countries, has struggled to find its equilibrium after the sudden demise of its economic and political system catapulted it into the modern world. Corruption is one of the difficult problems still bogging down the process of change, and the political strife with Serbia regarding Kosovo continues to deplete the nation. One of the fleet of generators on the sidewalks. We of course only saw the southern most tip of Albania but it looked like a region intent on making it. There was a lively bustle in the streets of the 3 towns we were in and people looked like they were planning on being winners and not losers this time around. Our Answer Man made references to the things that the people were doing themselves to better their communities, but that the infrastructure issues of 24/7 electricity and smooth roads just couldn't be done without an effective government. The archeological site and national park at Butrint was a good example of the efforts to charge ahead, perhaps with minimal government support. The list of outside sponsors was long, including UNESCO, the World Bank, and a number of Italian organizations. This tourist site looked like it came from an inspired team effort that was much more sophisticated than most of the sites we've seen in Greece and Italy. The site was very professionally and thoughtfully done with its neat paths and eco-friendly features. Albania's rich stash of natural resources to work with as it moves into the 20th century in the 21st century, but the rush to be a part of the modern world is already creating chaos with the seemingly poorly managed building spree. Understandably though, the Albanians won't be held back again. They are intent on being a part of western Europe and are anxious for the world to come visit them after so many centuries of forced isolation. After having such a positive experience in Albania we are intrigued and tempted to venture farther north in the future. But it is terribly difficult to decide if that is prudent or not. The British and American government websites for travelers are quite clear about the severity of the problems in Albania but also note that it is changing quickly. Our Answer Man felt that it would be safe for us to travel north through his country, even on bikes. He said that they show everything on TV in Albania, including the blood and guts of accidents and violence, and that he's not seen any indication that tourists have gotten caught up in the problems. Tomorrow morning we fly from Frankfurt to Portland for our round of visiting and re-outfitting.